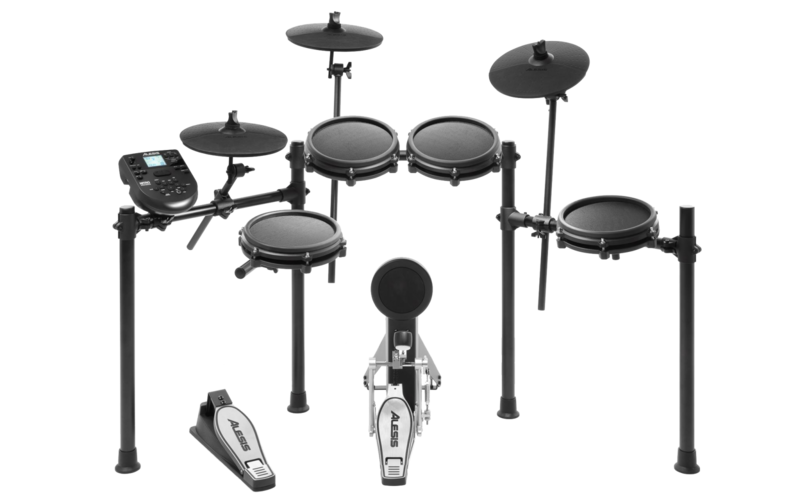 The Alesis Nitro Mesh Kit is a complete 8-piece electronic drum kit centered around next-generation Alesis Mesh head drum technology. The Nitro Mesh kit is the perfect choice for any electronic percussionist in any style, whether you’re just starting out, or looking to upgrade to a higher-quality kit with a professional module. This article answers some popular questions about the included features and the functionality of the Alesis Nitro Mesh kit. What are the differences between the Nitro Kit and the Nitro Mesh Kit? What is included with the Nitro Kit? Can I expand this kit with more drum triggers? What is the size of the kit when it is fully assembled? Is there a recommended type of drumstick I should use with mesh pads? What sample content is included with the Nitro module? What features will help me learn drums? Can I play along with songs on my phone/tablet/computer? Can the Nitro drum module connect to a computer to trigger drum software? Can I reset the module to its factory default settings? My headphones have a built-in microphone. Can I use these with my module? Should I set up the Nitro Mesh kit on a rug? The Nitro Mesh Kit expands on the playability of the original Nitro kit by upgrading to mesh snare and tom pads for an improved response and versatility. Mesh heads are the unanimous preference of electronic drummers for their natural feel and ultra-quiet response. Yes! An additional tom and crash cymbal can be added to the Nitro drum module with the Tom 4 and Crash 2 inputs on the rear of the module. The size of the completed kit will be around 4' x 3'. As with all of our kits, the arrangement is fully customizable and exact size can vary with different playing style and personal preference. While other standard or dual-zone single pads will likely work, the Nitro module is configured to respond optimally with the included drum kit. You could potentially use third-party standard triggers, however, since other manufacturers design triggers specifically for different drum modules, not all triggers may respond as expected. Although some companies make sticks specifically marketed towards mesh drum heads, it is not necessary to use a specific style of drumstick with mesh heads. Any wooden or plastic tipped drumstick will not damage the drum head. Unlike acoustic drums, the style of the stick will not affect the sound produced. If you would like to use a set of drumsticks other than those supplied with the kit, we recommend using a new set of sticks that have not been chipped, worn down, or otherwise damaged from playing an acoustic drum kit. The irregularities on a damaged drumstick can pull at the material on the mesh drum heads and cause it to deteriorate which over time may puncture the head. Avoid using felt beaters or mallets. The friction caused by the felt can wear the mesh over time. The Hi-Hat pedal included with the Nitro Mesh Kit is a continuous variable type pedal. This pedal allows for open, half-open, and closed hi-hat sounds, and will also allow for "chick" and "splash" sounds when the pedal is pressed down and released without striking the hi-hat cymbal pad. The Nitro module comes complete with 40 classic and modern ready-to-play kits. Easily tweak any existing kit, or create your own using the 385 superior drum, cymbal, and percussion sounds included in the Nitro drum module. The USB/MIDI connection allows MIDI information to be transferred between the module and the computer, so while it will not allow for audio file upload or transfer, it will allow for the module to send MIDI information to the computer to trigger your favorite DAW or virtual instrument. Beat (BEA) - This mode is for the snare pad only and helps develop timing, meter, and basic patterns. Rhythm (RHM) - Rhythm mode expands the learning environment to the entire kit and helps develop coordination and timing with the entire kit. Pattern (PTN) - This mode adds backing tracks for practice playing with accompanying instruments. Choose a pattern using the < and > buttons and press Start/Stop to begin. The pattern will count off and then repeat for you to follow along. To help with the learning process, every practice is recorded and scored by default. If you wish to practice without being scored, use the Play/Practice button to begin the sequence. The Nitro module features a 1/8" Aux input to allow you to connect a phone or other device for playback. To balance the levels, use the Volume knob on the Nitro module and the volume controls on your device. Yes. Hold the < and > arrow buttons simultaneously while powering on the unit. The screen will show "RST---" for one second and then the module will restore back to the factory default settings and be ready to use. The headphone output of the module is a common 1/8th inch (3.5mm) stereo output. Using headphones with a built-in microphone (TRRS) may cause drops in your audio. It is recommended to use standard headphones with a TRS cable. If the crossbars connected to the two center posts are loosened, the kit can be "folded" to make it easier for travel. A rug is not technically required, however, most drummers will use one by default in order to prevent the kick, pedals, or entire kit from shifting during play. When using any drum kit on a bare floor, the force of playing can cause some pieces to move (usually the kick pedal and pad). Arranging the kit on a rug or carpet is a regular solution to this. Whether you are a customer or dealer, if you already own an Alesis product, or if you just have pre-sales questions, the Alesis technical support team is available to help!